- Gross producing wells expected to be 22 by 12/31/11 and 51 by 12/31/12. 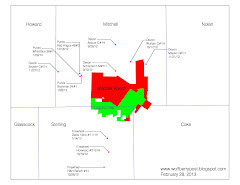 - Net producing wells expected to be 9.44 by 12/31/11 and 21.79 by 12/31/12. - Average production of 448 boe/d for three month period ending 9/30/11. - Average selling price of natural gas, $8.82/mcf! This is a great number indicating the presence of liquids. - Earnings per share for the quarter ending 9/30/11 are $0.05/share! - Revenues have increased from $668,862 (12/31/10) to $1,481,204 (3/31/11) to $1,869,753 (6/30/11) to $3,136,991 (9/30/11). This is an increase of 369% since 12/31/10. With the rapid development program on schedule for 2012, we should see revenues increase even more. - "We see potential to expand our Wolfberry Project by upgrading the reserves through successful develoment drilling." - "Our rapid oil and gas development program is ongoing. Current plans call for 31 gross Wolfberry Project wells to spud in 2012. This pace of development drilling will result in significant increases in production rates in 2012." Lynden is anticipating an exciting 2012 with significant growth and their enthusiasm permeates throughout their comments.